MADRID, May 11, 2010 (AFP) - A volcanic ash cloud from Iceland forced the shutdown Tuesday of airports for the first time in north Africa and in the Canaries and southern Spain, as it drifted as far as Turkish airspace. 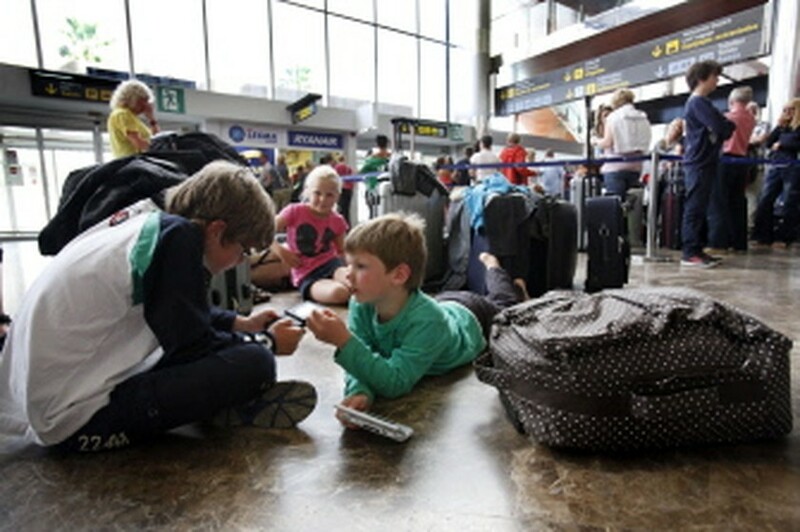 While most European air travel was "close to normal" on Tuesday, the continent's air traffic agency Eurocontrol said, restrictions and airport closings caused flight cancellations as winds pushed volcanic ash in the atmosphere into some new territory. Eight airports on Morocco's north and west coasts, including Rabat and Casablanca, were shut down, the first time the cloud of ash that has caused air traffic chaos in Europe over the past month has affected north Africa's airspace. Casablanca -- the hub of operations for Royal Air Maroc -- was to cease operations until 1800 GMT, together with the smaller airport in the capital Rabat, the transportation ministry said in a statement. Flights into and out of Tangiers, Tetouan, Essaouira, Agadir, Tan-Tan and Guelmin were also halted until 1800 GMT, the ministry said. By mid-day in Spain, air traffic control agency Aena had given the all-clear to reopen four airports that were shut down earlier in the day on the Canary islands of Tenerife and La Gomera and at Badajoz in southwest Spain. But the airports on the Canary Island of La Palma, and at Seville and Jerez in southern Spain remained closed. In all, some 180 flights were cancelled in Spain as of 0900 GMT, Aena said. Spain has also imposed overflight restrictions at altitudes between 20,000 and 35,000 feet (6,000 metres and 10,600 metres) in the skies over Seville, Madrid and Barcelona, Aena said. The cloud of volcanic ash which affected Turkish airspace last month returned Tuesday forcing flight bans up to an altitude of 20,000 feet over the Dardanelles Strait and the country's European corner for four hours from 1200 GMT, the General Directorate of State Airports said in a statement on its website. The major international airport at Istanbul however remained open. "At the moment, there is nothing affecting Istanbul. We do not have a critical situation in our hands," a directorate spokesman told AFP on condition of anonymity. Iceland's volcanologists explained that the ash in Europe's skies is left over from previous weeks and can travel around in the atmosphere due to winds. "We really don't know when it will settle down. So even if the volcano stops, we can look at this problem for a couple of weeks after," said Bjoern Oddsson of the Institute of Earth Sciences at the Iceland University. Iceland's Eyjafjoell volcano began erupting on April 14, releasing ash that last month caused the biggest aerial shutdown in Europe since World War II, affecting more than 100,000 flights and eight million passengers over a week. Ash had continued off and on to plague Europe's air travel and force flight cancellations for fear the ash could enter the plane's engine with fatal results. On Tuesday a Ryanair flight from Belfast to London was forced to turn back shortly after taking off Tuesday because of an "oily smell" in the cabin, the low-cost airline said. Ryanair was unable to say whether the plane was one of two grounded on Sunday because of technical problems and later found to have volcanic ash in their engines. Eurocontrol said in a statement it expected about 29,000 flights within Europe's skies on Tuesday. It also gave an optimistic outlook for transatlantic flights which have faced major delays in recent days, saying high ash concentration was dispersing at high altitudes in the middle of the North Atlantic. As for the ash cloud's further direction, Eurocontrol said it could move across the Iberian peninsula into southeast France but that "these areas (of high ash concentration) are of high altitude and are not expected to impact airports."